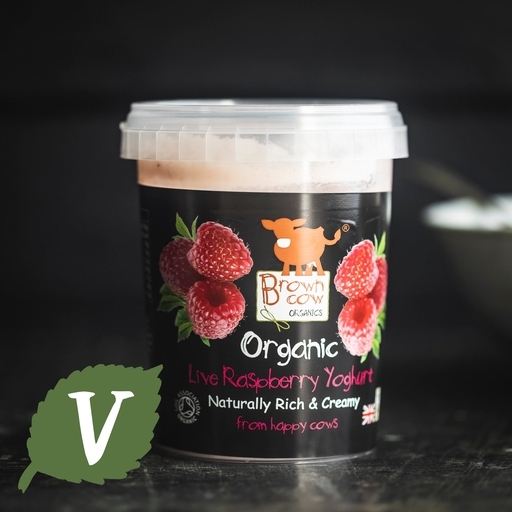 Brown Cow Organics’ live raspberry yoghurt is made on Perridge Farm in Somerset with unhomogenised milk from their beautiful Guernsey cows. This rich and creamy unhomogenised organic yoghurt is set off sublimely with the sweet tang of organic raspberries. Unhomogenised natural yoghurt (milk), raspberry purée (15%) (raspberries, sugar, water*, concentrated raspberry juice, lemon juice concentrate, pectin E330*, natural flavouring*, firming agent calcium carbonate*), live cultures.